The article examines the issues of internationalization and globalization of a modern economy. We revealed the role of transnational corporations in these processes. We studied such modern development trends of transnational corporations as a constant aspiration for self-improvement, access to cheaper natural, financial and intellectual resources, and competently built administrative structure. We proved that these trends of internal management allow global companies to participate directly in the country’s GNP formation (gross national product), and to develop individual industries and host countries’ economies in general. Artemova A.G. (2017). Cooperation between the state and metallurgical companies within the context of globalization [Sotrudnichestvo gosudarstva i metallurgicheskikh kompaniy v usloviyakh mirovoy globalizatsii]. Public-Private Partnership, 4(1). (in Russian). – doi: 10.18334/ppp.4.1.37727. Baryshnikov A. (2013). Metallurgiya: tekuschaya situatsiya i prognoz razvitiya [Metallurgy: current situation and development forecast]. Delovoy kvadrat. (7). 22-25. (in Russian). Bessonov V.V. (2016). Sovershenstvovanie upravleniya assortimentnoy politikoy predpriyatiya s pomoschyu marketingovyh issledovaniy [Improving the management of the assortment policy of the enterprise with the help of marketing research] Management and society: a modern model of interaction. 228-231. (in Russian). Bugay K.N. (2016). Osobennosti organizatsii sistemy upravleniya sferoy gosudarstvenno-chastnogo partnerstva v mirovoy praktike [Arrangement characteristics of PPP management system in world practice]. Journal of Public-Private Partnership. 3 (3). 189-200. (in Russian). doi: 10.18334/ppp.3.3.36549. Eremin A.V. (2011). Otsenka urovnya adaptatsii transnatsionalnyh kompaniy k konkurentnoy srede Rossii [Assessing the Adaptation Level of Multinational Companies to the Russian Competitive Environment]. Rossiyskoe predprinimatelstvo. (6-2). 12-19. (in Russian). Korukhov A.A. (2011). Perspektivy razvitiya TNK s pozitsii natsionalnyh interesov Rossii [Development prospects of multinational corporations from the position of Russian national interests]. Vestnik RGGU. Seriya: Ekonomika. Upravlenie. Pravo. (4). 166-174. (in Russian). Kostyleva S.Yu. (2009). Innovatsionnyy universitet i razvitie grazhdanskogo obschestva: amerikansko-rossiyskiy opyt i uroki [Innovative University and civil society development: American-Russian experience and lessons]. Aktualnye innovatsionnye issledovaniya: nauka i praktika. (2). 22. (in Russian). Kostyleva S.Yu. (2015). 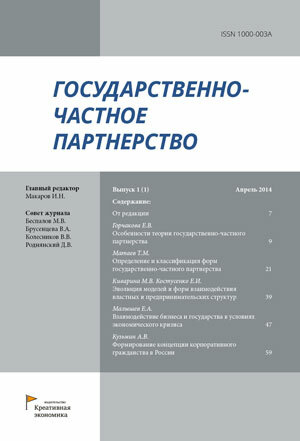 Institutsionalno-ekonomicheskiy mekhanizm soglasovaniya interesov vysshey shkoly i naukoemkogo biznesa v Rossii [Institutional and economic mechanism of coordination of interests of the higher school and the knowledge-intensive business in Russia]. Sotsialno-ekonomicheskie yavleniya i protsessy. 10 (5). 36-42. (in Russian). Kostylyova S.Yu. (2015). Institutsionalno-ekonomicheskie prioritety razvitiya regionalnyh sistem obrazovaniya [Institutional and economic priorities of development of regional education systems]. Sotsialno-ekonomicheskie yavleniya i protsessy. 10 (11). 55-61. (in Russian). Kryukova E.L., Lemeva I.V. (2016). Tendentsii razvitiya gosudarstvenno-chastnogo partnerstva [PPP development trends]. Journal of Public-Private Partnership. 3 (1). 53–62. (in Russian). doi: 10.18334/ppp.3.1.35138. Kuznetsov A.V. (2012). Transnatsionalnye korporatsii stran BRIKS [Transnational corporations of the BRICS countries]. Mirovaya ekonomika i mezhdunarodnye otnosheniya. (3). 3-11. (in Russian). Lokteva E.Yu. (2017). Strategiya vybora meropriyatiy dlya povysheniya konkurentosposobnosti kompanii [Activities selection strategy for improving the company''s competitiveness]. Rossiyskoe predprinimatelstvo. 18 (5). 723-732. (in Russian). doi: 10.18334/rp.18.5.37607. Makarov I.N. (2011). Znanie, vremya i gosudarstvenno-chastnoe partnerstvo: realii informatsionnoy ekonomiki [Knowledge, Time and state-private partnership: actual of informational economy]. Kreativnaya ekonomika. (4). 9-15. (in Russian). Makarov I.N. (2013). Gosudarstvenno-chastnoe partnerstvo v sisteme vzaimodeystviya biznesa i gosudarstva: institutsionalnyy podkhod [Public-private partnership in the interaction between business and State: an institutional approach]. Rossiyskoe predprinimatelstvo. (24). 18-29. (in Russian). Makarov I.N., Kolesnikov V.V. (2013). Natsionalnye sistemy upravleniya gosudarstvenno-chastnym partnerstvom [National Management Systems of Public-Private Partnership]. Rossiyskoe predprinimatelstvo. (13). 38-44. (in Russian). Nevskaya A.A. (2014). Tovarnyy eksport Rossii v ES: korporativnyy aspekt [Exports of Goods from Russia to EU: Corporate Perspective]. Mirovaya ekonomika i mezhdunarodnye otnosheniya. (8). 45-55. (in Russian). Tipanov V.V. (2013). Pryamye inostrannye investitsii: tendentsii i perspektivy razvitiya [Foreign direct investment: trends and prospects]. Vestnik Finansovogo universiteta. (1). 82-91. (in Russian). Vilkov I.N. (2015). Garmonizatsiya strategiy gosudarstva i biznesa kak instrument ustoychivogo razvitiya [Harmonization of the Government and Business Strategies as the Instrument for Sustainable]. Journal of Public-Private Partnership. 2 (1). 49-60. (in Russian). doi: 10.18334/ppp.2.1.1857. Vostrikov V.S. (2015). Vysokotekhnologichnye kompanii kak faktor strategicheskogo razvitiya otechestvennoy ekonomiki [High-tech companies as a factor in strategic development of the domestic economy]. Kreativnaya ekonomika. 9 (4). 473-484. (in Russian).